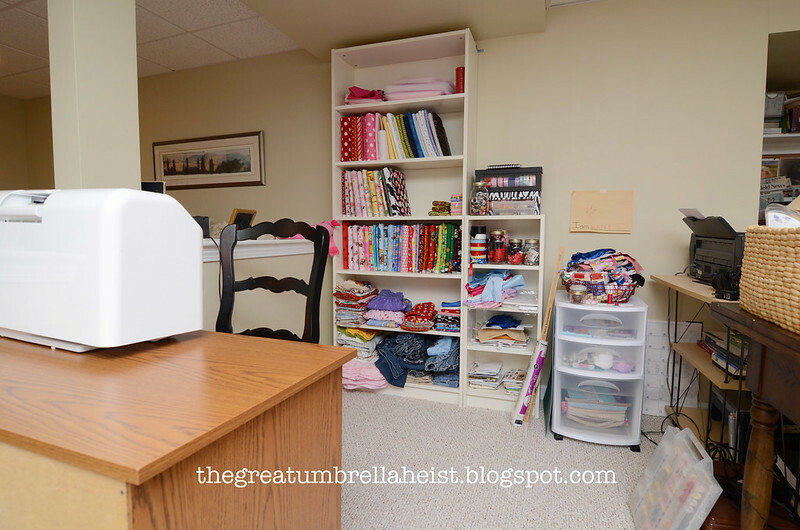 I finally managed to clean up and organize my little sewing space, which is a section of our finished basement. I prefer bright, airy spaces full of natural light and this is a bit man cave-ish but, hey, I'll take what I can get. It's better than having to set up shop temporarily on the dining room table. I have some recent sewing projects to share! 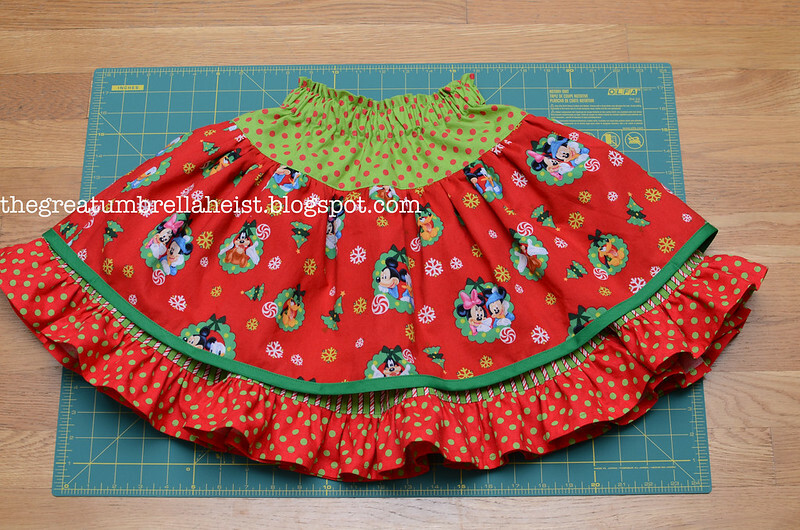 The first is one of three skirts that will be wrapped up and placed under our Christmas tree. I haven't decided who will receive this one yet. 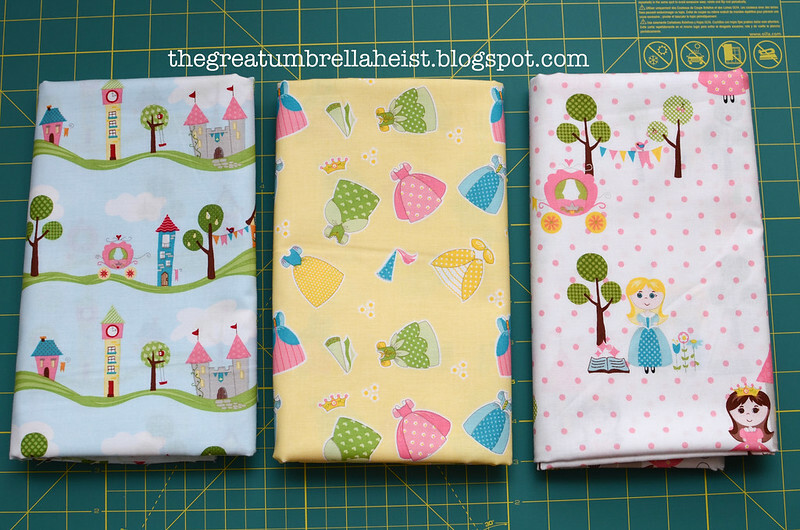 I think I'm going to use the owl fabric in all three but make them slightly different. 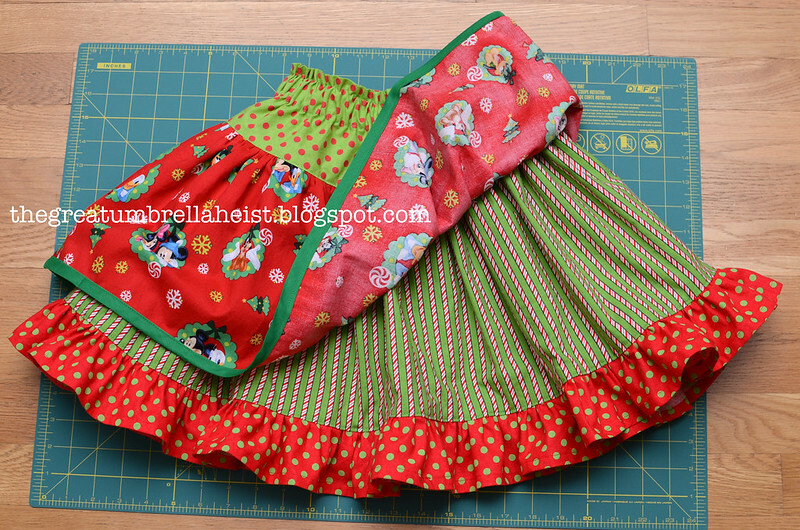 I also whipped up this double layer Christmas skirt. Okay, let's talk fabric. The only store close to where I live is Joann and we all know that they don't carry designer fabrics. (That sounds so snobby.) I have purchased fabric from Hawthorne Threads before and I love to browse their website but tend to stay away because it is pricey. I only buy fabric from Joann if it is on sale or if I have a coupon. A few weeks ago, I came across these fabrics on Hawthorne Threads and had to buy some. The girls love all three and have placed orders for a maxi skirt, a twirl skirt and a dress. 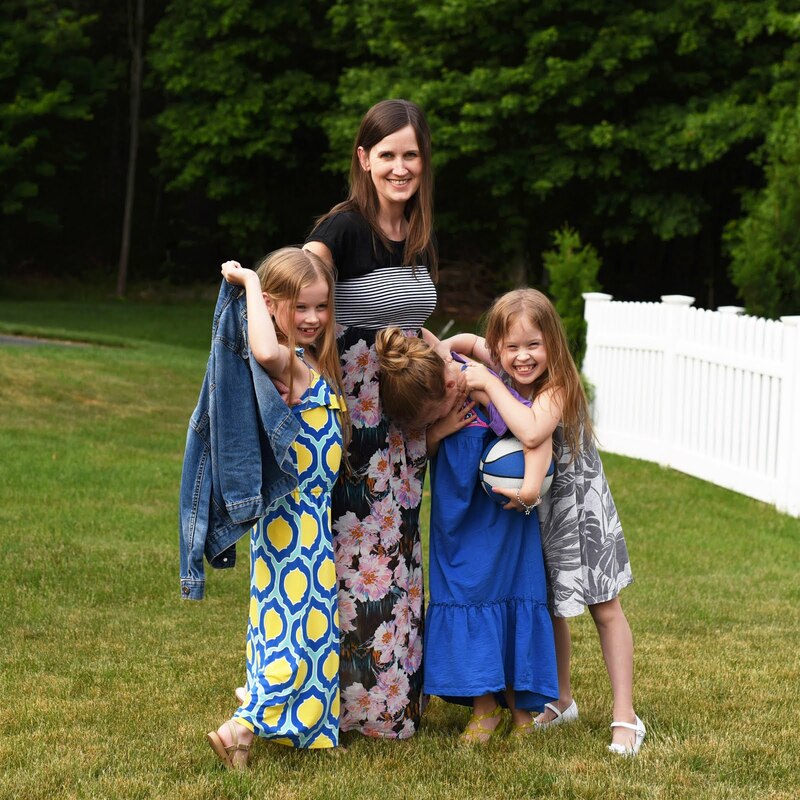 I do admit that there is a difference in more expensive fabric but because my kids are only five years old and could at any moment dump a bowl of vanilla ice cream covered in chocolate sauce all over themselves, I don't mind using the less expensive fabric. Hawthorne Threads doesn't even know that I exist so this isn't a paid review or anything. I just want to comment that my experience with them has been great. My latest purchase was made at 9:30 on a Thursday night. My purchase arrived in the mail on Monday and it was packaged up really well so that if it had been raining or snowing, the fabric wouldn't have been damaged. This next fabric selection is for my anonymous commenters (all two of them) who have accused me of only using cheesy fabrics that look like scrubs material. Who knew? I had to google it and there really IS a Rainbow Zebra story (and cloth book). The link above explained it pretty well. I was curious and now I know the Rainbow Zebra story. Just thought you might like to read that post as well. Sometimes they are a bit cheesy but I understand that you sew clothes for your five year old girls to wear so it is what they like. You are mega talented though....you should really consider opening an online store like you said. My son had a cloth book my mom made him as a baby called The Rainbow Zebra! So I am loving your fabric! My son is now 13 and I am wondering what happened to the book. I love the owl skirt! So cute! A good friend of mine makes custom handbags and purses and she uses spoonflower.com to design her own fabric for special projects (wedding parties etc.). She has a blast with it! But beware, it can be a mega time-sucker and you don't have much time to waste! Love all of your sewing projects! I wish I had your talent! You need to open up an Etsy shop. Like seriously! Yes, fabric hoarding IS real! I've only been sewing about a year and I have figured that out myself. Ha! Love the owl skirt. I have made several basic twirl skirts for my girls, but next time I'm going to try the ruffled waist and the ric rac on the bottom. So cute! You do such beautiful work. The girls must love having such pretty twirly skirts. For other fabric, have you tried the Franklin Mill Store? It's one exit up from the outlets so it might be worth a trip now and then. Or the Fabric Place in Natick if you are ever up that way. Do they have Hobby Lobby near you? If you ever get a chance to visit one, they have cute fabric and always have 40% off coupon that you can get online. I have the Hobby Lobby, but no sewing talent! PS Love how adorable your family is! 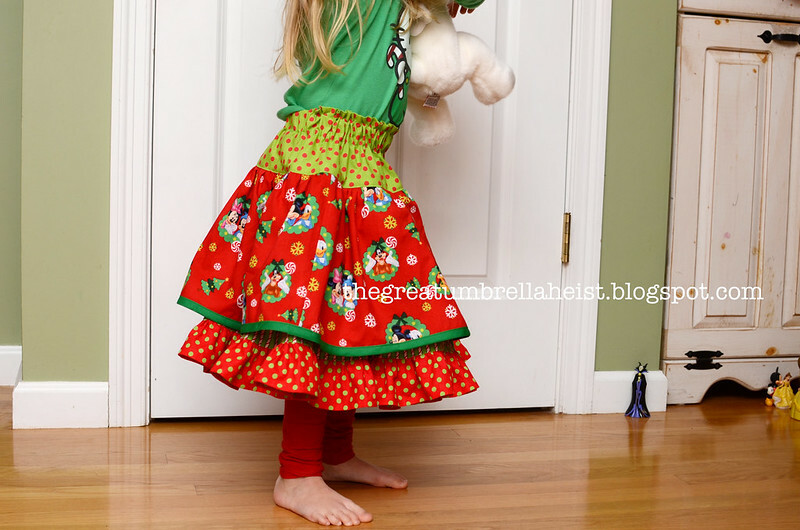 I love all your skirts and all your fabric choices - very adorable - the owl fabric is my favorite. As for the comments that say the fabric is "cheesy" - I have to say that is extremely rude - I can not stand when people are so rude! Thank you, thank you for the nice comments regarding the skirts!!! 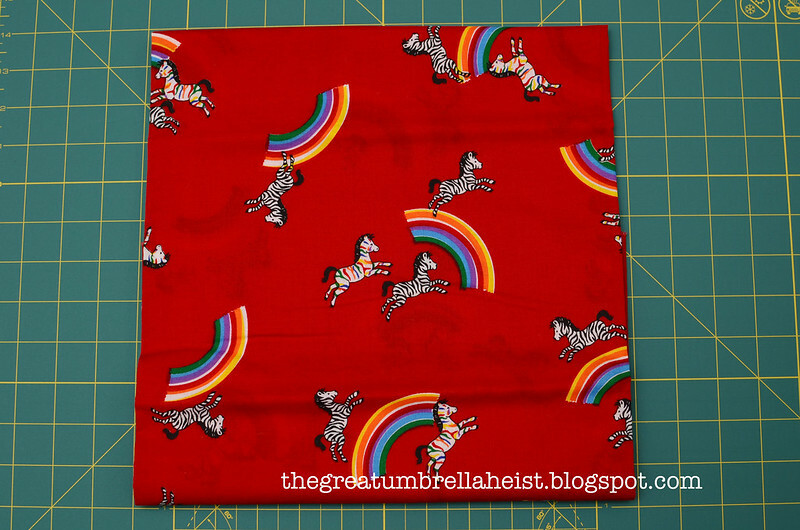 I'm so glad I posted that rainbow fabric. I thought it was from 1983 and didn't even think to google it. Now it all makes sense. There's a new Hobby Lobby in RI but it's about an hour away so I haven't been there yet. Christi - I forgot about the Franklin Mill Store! I haven't been there in 7 years or so. (Grammy had a bad experience there with a rude salesperson.) I'll have to check out fabricworm. I'm having pinterest issues right now. I tried to pin those skirts and the picture shows up at first and then turns into a question mark and doesn't pin. And pictures are disappearing. I'll have to try again later. I love your skirts. They are AWESOME. yes, fabric hoarding is very real. I just realized that don't have Hancocks were you live. i live in the south were they are plentiful. They do sell online www.hancockfabrics.com . They might be worth checking out. Oh and Fabric.com is having it's 12 days of Christmas sale and Michael Miller fabrics will be on sale this week along with several other designer fabrics. 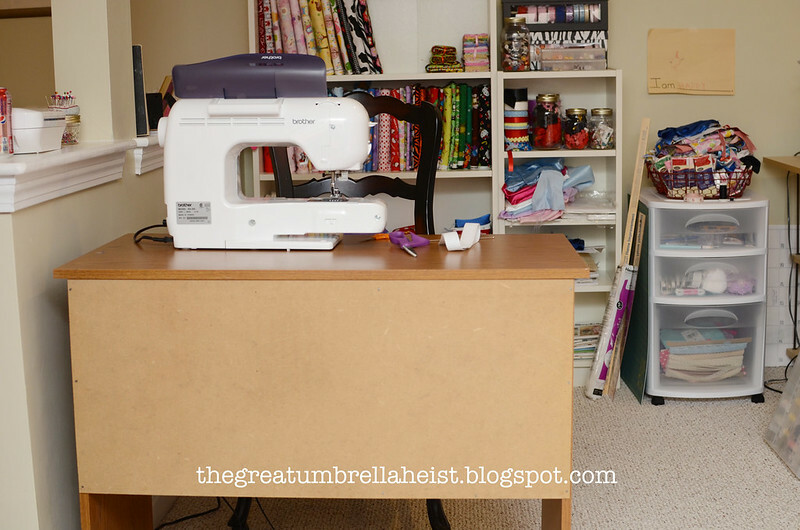 I absolutely love your sewing studio space! I would love a space like that at our house! When we were little my grandma made dresses for my sister and I plus the three foster kids living with our family at the time out of that rainbow zebra print! The is an excellent portrait of all five of us somewhere that I want to go dig up now. Thanks for posting it! You need to open an etsy shop! You will have an order for two owl skirts right here. You are extremely talented! please make me something from the rainbow/zebra fabric. :D that is awesome!!! I'm thinking of buying a sewing machine and was wondering what brand you'd recommend? Thanks! I love your work space, and your girls' clothes, too!